It is a relatively simple process to check the coolant level in your vehicle. It is absolutely essential to remember that the coolant level must be checked when the car is cold. Today's cars generally have an overflow tank for the coolant beside the radiator that is opaque. It is made from plastic that is white in color and this will allow you ascertain the coolant in your vehicle is at a safe level. On the side of the overflow tank you will also see some type of markings that can tell you at a glance how low or high the coolant level is. To ensure that you have no leaks in your vehicle coolant system, several times per year you should check to see what the coolant level is at. If the coolant level is low you will be required to top it off. The liquid added in for the engine's use is a 50/50 mix of water and coolant. This gives the radiator in your vehicle the optimum freeze protection or boiling point. Automotive supply stores sell coolant that has already been mixed. To put the coolant into your vehicle, unscrew the top of the overflow reservoir, and slowly pour in the mixture until it has reached the full mark. If you seem to be consistently filling up the coolant in your vehicle, and yet the levels continue to drop, this can be an indication that you have a leak somewhere in the system. It could be something as simple as needing a new radiator hose, or it could be a symptom of a serious issue. If you have any reason to believe that there may be a leak somewhere in your cooling system, or if it is time to change the coolant in your vehicle, schedule an appointment with Gorruds Auto in Milton, Ontario, Canada. The Precision Service team will thoroughly investigate and check to see if it is possible that a small amount of preventative maintenance now will be able to save you from more serious problems in the future. 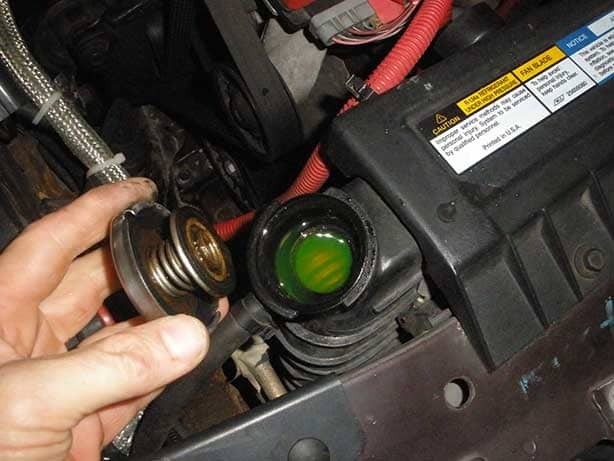 Trivia Time: In order for the vehicle coolant to be easily distinguished by you, it is green in color. If you find that there is a green spot or puddle underneath where you have parked your vehicle, the most obvious reason is that coolant is leaking. The coolant in your vehicle is green in color to distinguish it from other fluids. A green spot on your driveway likely means your vehicle is leaking coolant. If this happens, contact Gorruds Auto right away for a service appointment. Tip: While you are there, have the coolant and antifreeze level in your vehicle inspected by a member of the Precision Service certified technician team.